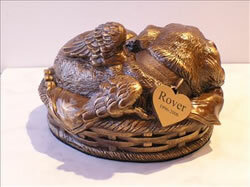 Our Custom Painted Angel Winged Dog Urn is a sweet little dog sleeping cozily with his blanket in a basket. Cast in polymer with bronze additive, this urn has amazing detail yet is lightweight and, of course, much less expensive than it would be as a sculpted bronze urn. The cremains can be loaded through a 2.5 inch diameter opening in the bottom which is then closed with a plastic plug. The bottom of the urn is covered in felt to protect furniture. As with any urn, it is important to keep the cremains in a sealed plastic bag inside the urn. This plastic bag will take up 5-10 cubic inches of the volume of the urn. Please allow 2-3 weeks for our artist to complete the painting. Please email multiple photos to admin@memorial-urns.com or attach them to the order confirmation you receive after placing your order. Engraving is included on a heart shaped brass colored tag with a peal-off sticky back so you can attach it to the heart-shaped area on the dog collar. Please limit name to no more than 10 letters and dates to years only. Capacity: 45 cubic inches for MOST dogs up to 30 lbs. Size: 7.5" x 6.5" x 4" inches. Capacity: 90 cubic inches for MOST dogs with healthy weights up to 70 lbs. Size: 9 x 7.5 x 5 inches. We cannot guarantee that the size urn you choose is the correct size for your pet. Please contact the pet crematory to see what size (cubic inch capacity) urn to purchase.